Background: Age-associated loss of liver function has been recognized for decades. But, the mechanism driving liver regeneration and its decline with age remains elusive. Objective: Hence, to support of our previous studies about anti-aging effects of Ursolic Acid (UA), a compound which is extensively present in apple peels. The aim of this study is to address whether UA might alter sensors of the cell metabolic state such as SIRT1, SIRT6, PGC-1β and Klotho proteins. Methods: To evaluate the effect of UA on hepatic indicated proteins, mice were administrated with UA twice daily for 7 days. 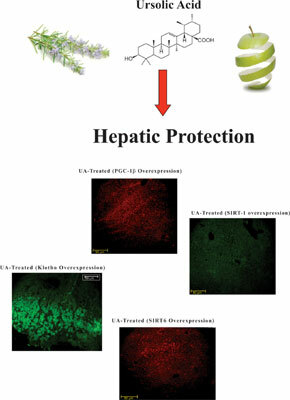 The involvements of these proteins in the UA-mediated effect harmony hepatic protection were investigated by immunofluorescence microscopy technique. Results: Our findings clearly illustrated that UA enhanced SIRT1 (~ 5 ± 0.2 folds) and SIRT6 (~ 8 ± 0.5 folds) proteins levels in hepatic, p<0.001. In addition, the data showed that UA increased PGC-1β (~ 7 ± 0.4 folds) protein overexpression, p<0.001. Moreover, we showed that UA upregulated Klotho (~ 3.5 ± 0.2 folds) protein in order to improve hepatic performance, p<0.01. Conclusion: Our results suggest that UA through increasing of SIRT1 up-regulation ameliorate reverse cholesterol transport, fatty acid use and oxidative stress defense. In addition, it seems that UA by enhancing of SIRT6 expression promotes cholesterol homeostasis through repressing SREBP1 and SREBP2. Reciprocally, UA might be involved in VLDL synthesis and exportation through PGC-1β up-regulation. Finally, UA might be as key regulators of mineral homeostasis and bile acid/cholesterol metabolism, by inducing Klotho overexpression. Keywords: SIRT1, SIRT6, PGC-1β, Klotho, anti-aging biomarker, ursolic acid. Keywords:SIRT1, SIRT6, PGC-1β, Klotho, anti-aging biomarker, ursolic acid. Abstract:Background: Age-associated loss of liver function has been recognized for decades. But, the mechanism driving liver regeneration and its decline with age remains elusive.